Something there is in us that does not love a gap. (And something in us doesn't love a wall either - we are really very fussy people!) But when we sense a gap, we race to fill it. When we speak we are so afraid to leave a pause in the flow of words that we fill the time in with interjections like "you know" and "right?" When we see a circle with a small break our mind fills in the gap and reads it as a whole. And when we see a gap in the garden we immediately race to the nursery to fill it up. He or she who dies with the least bare dirt showing wins. My husband once admitted that he thought that was the objective of planting - not to let any dirt - excuse me - SOIL - show. (It's soil when you plant in it. It's dirt when you track the same stuff all over the clean kitchen floor.) Now I have seen gardens where each plant is beautifully spaced and the attractive mulch surrounding them is quite visible. It's a nice look but I despair of ever achieving it because plants grow at such different rates, so that in one area a rapid spreader wipes out all available space, and in another a very slow spreader leaves so much space around it that even those who like an uncluttered look might protest. So I am one of the "no gaps allowed" school - which means that I use a lot of "filler" to complete my garden. What the heck is "Filler"? I discovered filler way back when I was n college and worked for a florist during my school breaks. I had never thought much about flower arranging and how they got the bouquets to look so lush and colorful - I guess I vaguely reasoned that they used a lot of flowers. So I was surprised when my first lesson began with the florist going to the cooler and picking out a lot of leafy stuff - ferns, huckleberry, salal and other types. He started his creation by working strictly with those greens, to give the arrangement shape and some lovely contrasting textures. When he was done the basket looked attractive - even without flowers. What really surprised me was that given that framework it really didn't take that many flowers to make a beautiful arrangement. So I started thinking of my garden as though it were some gigantic floral arrangement. And the first step is exactly the same as it is with arranging in a vase - you start by building a structure for your garden, using filler. We all need it, whether we are starting a new garden or maintaining an established one. If we plant perennials and shrubs at the proper distances from each other, we have huge gaps until those plants mature. And even a mature garden ends up with unplanned for gaps, whether they are created by underground burrowing critters, harsh weather conditions or plain old neglect. Besides (this is my eternal refrain when I show up after an alleged trip to the grocery store but come home with a few pots full of plants instead) the less dirt we let show, the fewer weeds we have to worry about. 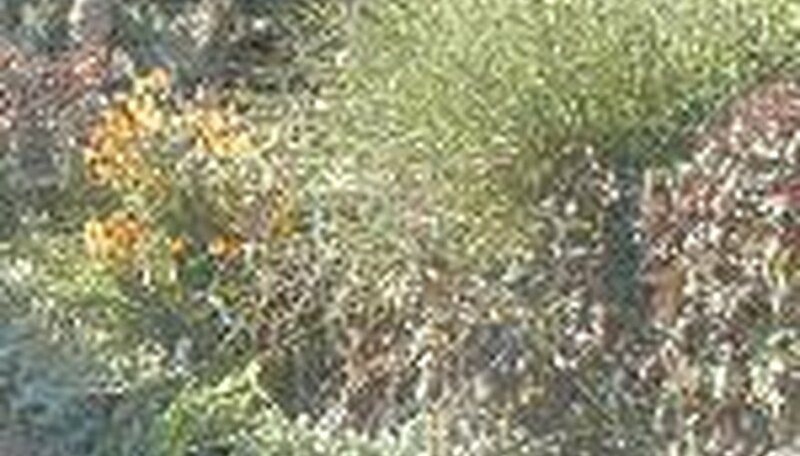 Filler is usually foliage, although certain flowering plants also work - take Gypsophilia (baby's breath) or even lavender. The flowers aren't terribly showy but they add a certain quality to the bouquet that makes a huge contribution to its overall beauty. There is also an annual version of baby's breath - not quite as ethereal as the perennial type, but it flowers quickly from the initial sowing, which makes it extremely handy. Most of us think of Queen Anne's Lace as a weed, but it, too, functions beautifully as filler, from its fern-like foliage to its lacy flowers. So if it insists on growing in your gardens, maybe you should let it. Within reason, of course. Another good floral filler is Nigella - "love in a mist" which is almost ethereal with the delicate mist of foliage surrounding the flower. Nigella grows quickly from seed and can be kept going throughout most of the growing season, so it is a great way to fill unwanted gaps while you wait for slower perennials to catch up. 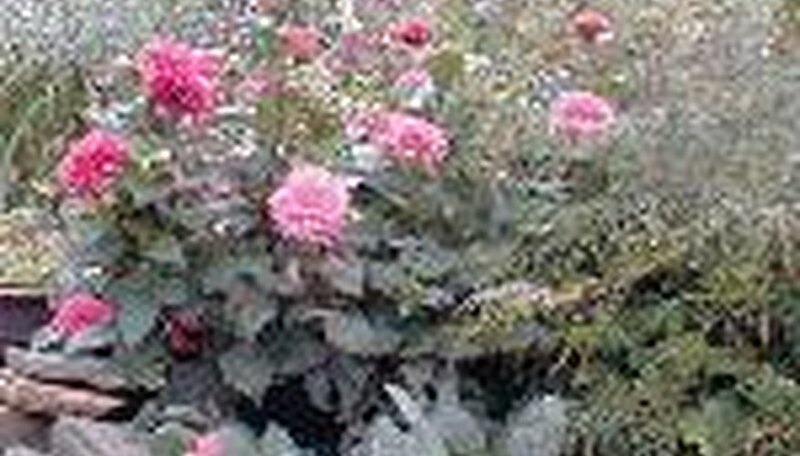 Most annuals make great fillers, since they grow so quickly and have such long flowering periods. And if the permanent residents of your beds use a relatively simple color scheme, you can use those annuals to create a new look every year - going pastel one year, primary the next, deep and dramatic another year - or even every season. Foliage filler is more functional than flower filler. It not only adds texture to the garden, but also helps to determine its shape. It works in the garden exactly the way it works in a flower arrangement. Flowers don't last the way leaves do. So the foliage will be in the garden all season long. So use it to create form and structure in the beds. Think of the bed as a gigantic vase. What form do you want your arrangement to take? Do you want something tall in the center? Something that cascades toward the front? You can use shrubs at the back of the border, or tall ornamental grasses. 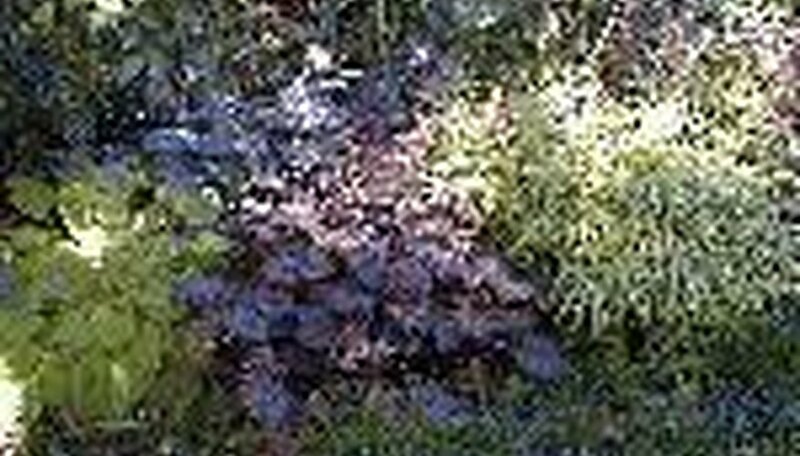 In shady areas you can use some of the larger ferns for height. I like to start at the center - my midpoint - and work outward, so I find a few good plants with contrasting foliage to plant dead center and descending from there to slightly lower plants at the back right and left sides. Think not just height but texture. 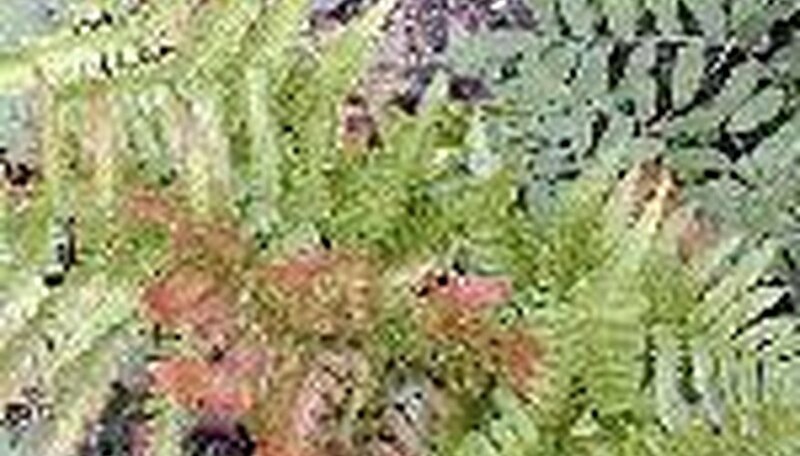 Most ferns or grasses have relatively fine foliage, but their shapes are different enough to create a pleasing contrast. Then you may want to look for a couple of plants with big, bold leaves to create structural interest. Some leaves are very intricate - like most ferns. Some are quite simple, like the oval, slightly pointed leaves of the dogwood. Some are huge and bold - think of hostas, Rheum palmatum (ornamental rhubarb) or colocasia - elephant ears. Others are tiny and quite dainty - like the many nepetas and campanulas, or Veronica peduncularis 'Georgia Blue'. Then you have the spiky ones - yuccas, bearded irises and kniphofia to name a few. And of course some leaves are smooth ands shiny, such as the foliage on most roses, while others are practically corrugated (some of the more interesting hostas do this) and others, like Stachy byzantina are quite fuzzy. 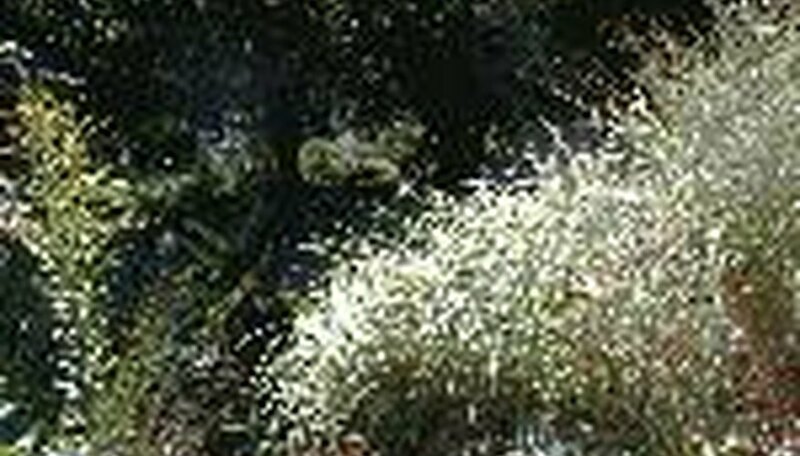 Many grasses grow erectly, but others flow outward in a graceful vase or fountain shape. Some form perfectly rounded mounds. A few, like hakonechloa cascade forward almost like waves crashing on the shore. Many bulbs, such as bearded irises and daylilies will give you a fan shape, like a row of broad and slightly tipsy exclamation points. The dissectum type of Japanese maples also have that weeping, forward flowing form along with a very lacy texture. Both are perfect for hiding the yellowing foliage of spring bulbs, too, as they won't really get growing until the bulbs are done. There are a few areas of my own garden that are colorful enough that no one ever notices that there are no flowers in it. Foliage in itself can be incredibly colorful, even if you stick to cold hardy perennials. Many, many plants have silver foliage, or gold, and there are also plenty of purple plants out there. Some leaves are variegated and show streaks, stripes or dots of pink and white, orange and gold - sometimes all at once! A few plants have leaves that are golden brown (which makes it quite hard to figure out if they are actually alive). And of course, foliage comes in too many shades of green to try to count. As you see, you can create a lot of visual (not to mention tactile) interest by simply choosing your filler material wisely. And it is wise to do so - because that way the garden will look good even in those months when not much seems to be in flower. Putting it all together You could almost take a sort of Chinese menu approach to garden design - choose one plant from column A to plant with one from Column B - until you have a nice symphony of color, form and texture. Contrast bold with fine, light with dark, rounded with spiky and you will have filled in a lot of garden beautifully. And don't forget - many of these filler plants also just happen to have beautiful flowers that will light up the garden for a few weeks in summer. So choose the flowering plants and shrubs with some eye to how those colors will interact. When all your filler is in place it's time to add the finishing touches. 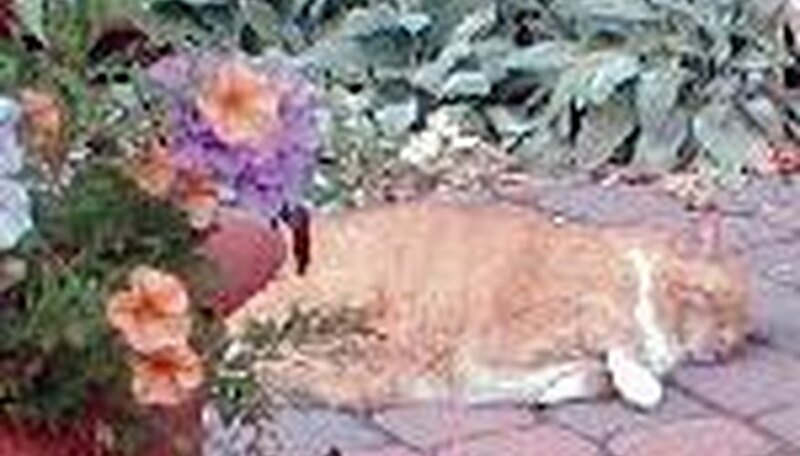 Your pet perennials, favorite flowers - the beautiful blossoms that are now ready to be set in place, as carefully as a jeweler would set stones. Or the way a florist would finish off an arrangement. Except that, as we know all too well, a garden is never finished. What you have done is simply to set the stage and then set this season's performance in motion.